I returned to the Wick this morning and the long ledge I discovered yesterday. I began drawing the ledge at 08:30 and ran out of paper (3 metres) a third of the way along at Midday. The plan was to repeat the same section of ledge below but Skomer was hit by an incredible thunder storm and I had to escape the cliff. On the way back the rain was so heavy the paths ran with a foot of water, draining into the burrows, even flushing out Manx Shearwater that would never normally leave or enter their burrows outside the cover of darkness. I can't see it (bottom left of page). The storm passed quickly and I managed to return late afternoon to add another two drawings of the ledge section. 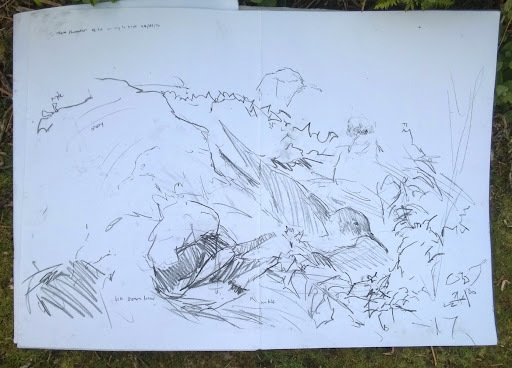 The aim here was to create a time-lapse drawing that showed any change in the number, density and behaviour of guillemots on the ledge throughout the day. In the evening I certainly noticed an increase in numbers as expected because around 4-8pm is a change over period when pairs swap over incubating the egg, there is also apparent heightened tension around this time with allo-preening and aggressive behaviour seeming to increase. However what really stands out when comparing the time-lapse is the way the overall composition of the groups remain unchanged, so that hour after hour it is possible to pick out the same birds by their location within the mass of activity, because of their loyalty to the same few centimetre square nesting site.